Two years ago, I blogged about my experience rewriting the plot.qcc() function in the qcc package to use ggplot2 and grid. My goal was to allow manipulation of qcc’s quality control plots using grid graphics, especially to combine range charts with their associated individuals or moving range charts, as these two diagnostic tools should be used together. At the time, I posted the code on my GitHub. 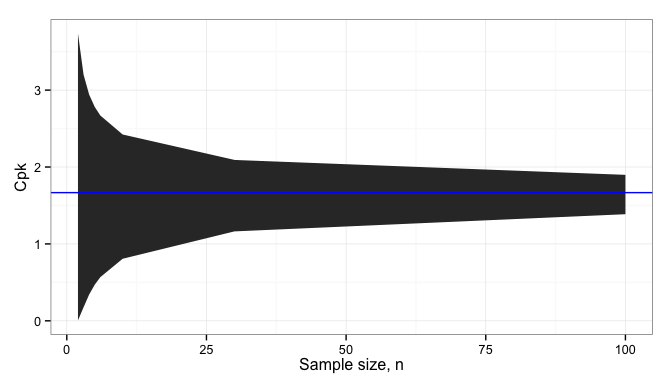 I recently discovered that the update to ggplot2 v2.0 broke my code, so that attempting to generate a qcc plot would throw an obscure error from someplace deep in ggplot2. The fix turned out to be pretty easy. The original code used aes_string() instead of aes() because of a barely-documented problem of calling aes() inside a function. It looks like this has been quietly corrected with ggplot2 2.0, and aes_string() is no longer needed for this. The updated code is up on GitHub. As before, load the qcc library, then source() qcc.plot.R. For the rest of the current session, calls to qcc() will automatically use the new plot.qcc() function. We’ve seen in the previous posts that in designing products we need to know characteristics like the mean and standard deviation of the population, but are limited to only being able to measure sample means and standard deviations. This leaves us with uncertainty in our knowledge of population characteristics, and that uncertainty directly impacts our ability to make better products. 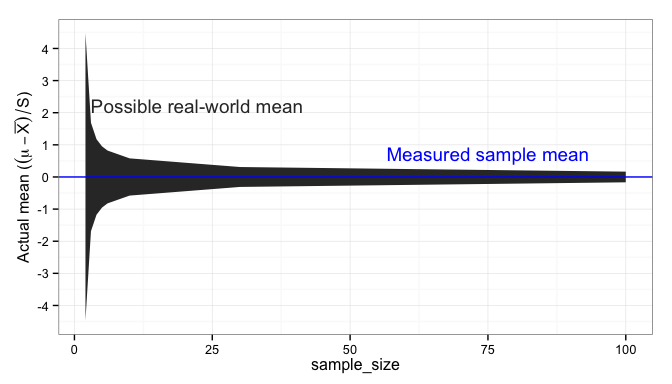 In this post, we’ll see how business financial requirements and estimation uncertainties due to sample size interact both to to further limit our available design options and to drive up our sample size requirements. As outlined in the first post of this series, we are going to cut material costs by 10% on a part that had to weigh at least 100 kg. That was a $6 reduction in costs on a $120 part. Our first issue is that we have to be sure that we have a good baseline for improvement. If the existing parts are very different than our expectations, we may be creating more trouble by making changes. We also don’t know how much variation there is in part weight. We calculate that we have to remove kg, reducing mean weight from 120 kg to 108 kg. Part Weight 100 108 ? Standard Deviation 0 2.7 ? However, there would be substantial risk that we would not achieve our goals of both meeting the customer requirement of 100 kg and reducing material costs by 10%. Using these numbers as our target, we have a 50% chance that we will be over the cost target, and a 50% chance that our defect rate will be higher than target. In order to meet customer requirements, we want to be confident that all parts weigh at least 100 kg. In order to meet business needs, we have to be 95% confident that at least half of our product weighs at most 108 kg. For the customer requirement, we need to calculate the Cpk. In the past, “all” product really meant a Cpk of 1.0, or 93% of product. To calculate this we need our 95% confidence estimate of the mean, and our 95% confidence of the standard deviation, . Now we need to design and build our prototypes. How many parts do we build and weigh? Recognizing that there will be uncertainty in our estimate of and from such trials, we cannot simply calculate and and then calculate the estimated Cpk based on the sample, since there is a 50% chance that our products will be worse than we measure from our study. We have to be more careful with our customer base than that. These equations are easier to understand if we graph them for several values of . This graph shows the maximum and minimum possible to assure compliance with customer requirements on both weight (solid green line) and the cost targets (dashed blue line), for four different values of . Red regions indicate that both sets of requirements cannot be met; green shaded regions indicate possible that meet both sets of requirements. As can be seen, while we calculated a naive target for standard deviation, , of 2.7 kg, the measured sample standard deviation, , must be much smaller to assure that we meet requirements. Likewise, small sample sizes can make it impossible to assure that we meet requirements. Not only do we have to design our product and process to be more stringent than the naive requirements, we have to test more than we might otherwise wish to. Importantly, our specification now contains the tolerance ranges on the weight, the standard deviation of the weight, and the Cpk. This is the minimum set of information that we need to fully specify a part. 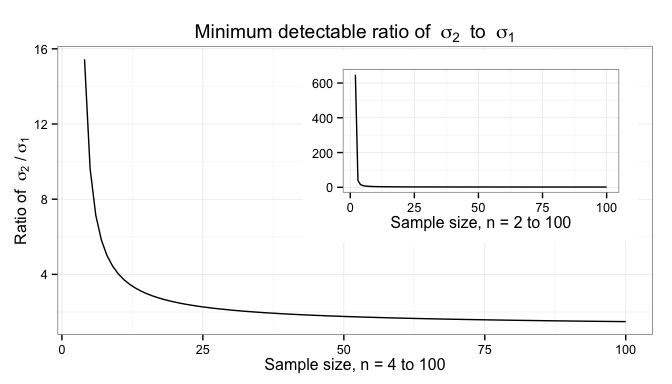 For the purposes of testing and checking short-term process performance, we also need to specify the number of samples to collect and sample mean and standard deviation. UPDATE 2016-08-25: Equations were no longer rendering correctly; this was fixed. 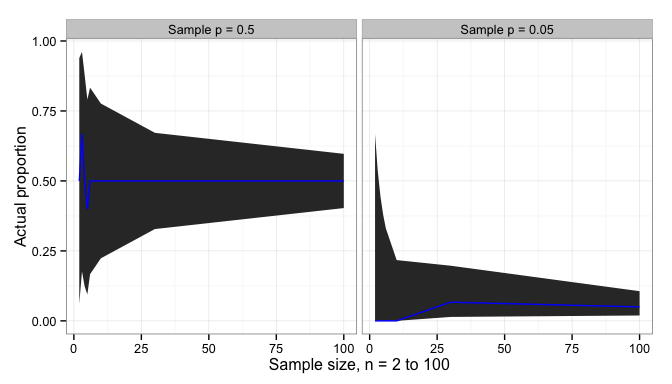 Previously, I introduced the idea that samples do not look exactly like the populations that they are drawn from, and had a closer look at what impact sample size has on our ability to estimate population statistics like mean, proportion or Cpk from samples. Here, I will have a closer look at how this uncertainty impacts our engineering process. In the next post, I will tie in the engineering impacts and decisions to the business value and costs. When we are testing, we’re either testing to determine that the new product or process performs better than the old or, for cost reduction projects, that the cheaper product or process is at least as good as the existing one. 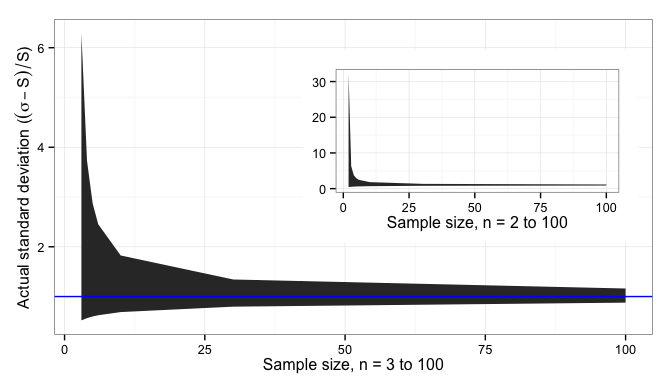 Given the uncertainties in our estimate of and , illustrated above, it should be clear now that with small sample sizes we can only detect large differences of many multiples of the sample standard deviation, . When trying to determine if a new product or process is better than an old one, we are usually interested in shifting the mean. We want a product to be lighter, provide more power, or a process to work faster. In such cases, we need to estimate the difference of the means, and ensure that it is different than 0 (or some other pre-determined value). 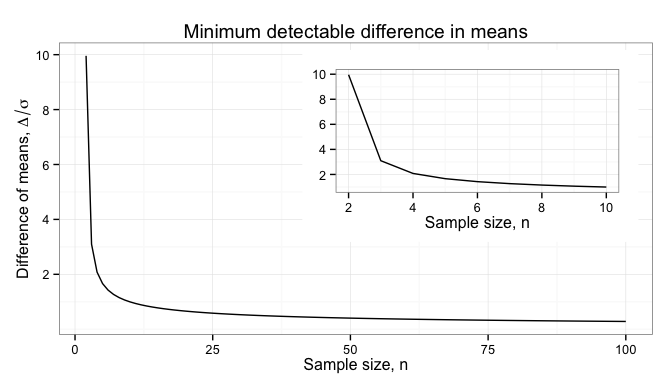 The minimum difference that we can reliable detect is plotted below for different sample sizes. In many Six Sigma projects, and any time we want to shift the mean closer to a specification limit, we need to compare the new population standard deviation with the old. The simplest way of making this comparison is by taking the ratio , where is the larger of the two variances. The dependence on sample size is illustrated below. 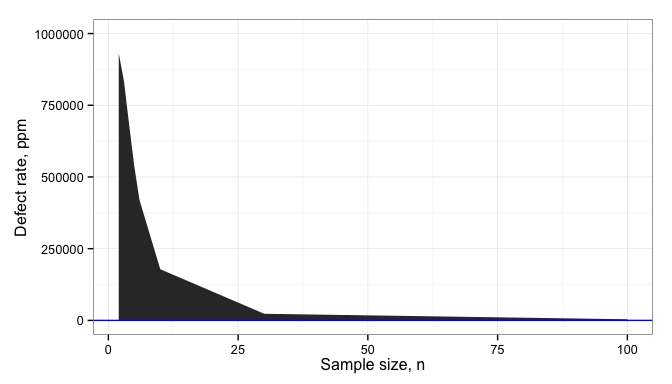 You can see from the inset plot, which includes sample sizes of 2 and 3, that small sample sizes really hurt comparisons of variance, and that interesting differences in variance can’t be detected until we have more than 10 samples. Proportions, such as fraction of defective parts between a new and old design, can be compared by looking at the difference between the two proportions, . 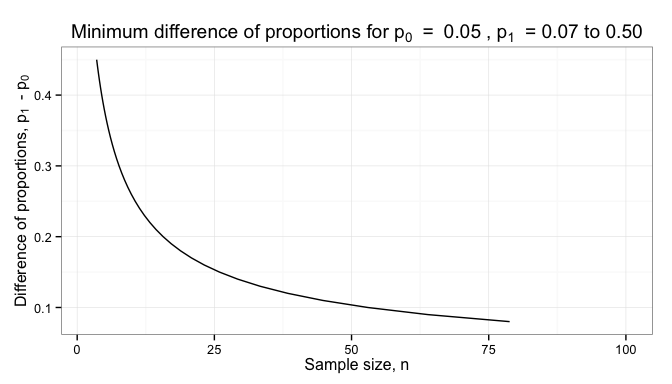 You can see from this that proportions data provides much less information than variable data; we need much larger sample sizes to achieve usefully small . 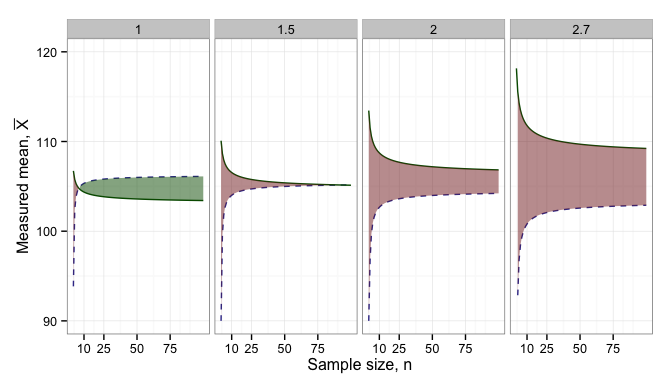 When designing experiments, the goal is to detect some difference between two populations. The uncertainty in our measurements and the variation in the parts has a big impact on how many parts we need to test, or greatly limits what we can learn from an experiment. Next time, I’ll show how these calculations of sample size and uncertainty impact the busines.